Its influence and presence has kept the peace at all labour meetings since its foundation, and the knowledge of its existence and of the spirit of its members has contributed to prevent the employers and the government from proceeding to extremes against the fighting unions. It has in a true and real sense added many shillings per week to the pay of the union members, since it and it alone has prevented the Government doing in Dublin what it has done in Barry, namely, send soldiers in to do dockers’ work during a strike. Nationally it has done much more. When the great betrayal was perpetrated on Ireland, and John Redmond and his followers, aided by all the capitalist press of the country, joined in a conspiracy to rush the young men of Ireland into the ranks of the British Army, the first stirring blow struck against that betrayal was the historic meeting in Stephen’s Green on the night of Redmond’s Mansion House fiasco. Who took the field that night in spite of the massed battalions of the British Army, waiting the word in every barrack square in Dublin? It was the Irish Citizen Army sprang into the gap, and by its fearless presence gave new heart and hope to the dismayed and betrayed people of Ireland. When the first deportation order was issued to the first victim, Captain Robert Monteith, who leaped to arms and invited the people of Dublin to hurl their defiance in the teeth of the Government? Who rallied to the meeting despite torrents of rain, and in face of the open demonstration of armed force by the Dublin garrison? Again it was the Irish Citizen Army. Who on every occasion on which the enemy has struck his blow at those who stood for freedom has ever hastened to the side of the victims declaring their cause to be its own? THE IRISH CITIZEN ARMY! Who, when the protest meeting was held in the Phoenix Park under directions of the Volunteer Committee, were the only armed body to attend and declare their adhesion to the cause of their imprisoned brothers in arms? THE IRISH CITIZEN ARMY! An armed organisation of the Irish working class is a phenomenon in Ireland. Hitherto the workers of Ireland have fought as parts of the armies led by their masters, never as members of an army officered, trained, and inspired by men of their own class. Now, with arms in their hands, they propose to steer their own course, to carve their own future. Neither Home Rule, nor the lack of Home Rule, will make them lay down their arms. However it may be for others, for us of the Citizen Army there is but one ideal – an Ireland ruled, and owned, by Irish men and women, sovereign and independent from the centre to the sea, and flying its own flag outward over all the oceans. We cannot be swerved from our course by honeyed words, lulled into carelessness by freedom to parade and strut in uniforms, nor betrayed by high-sounding phrases. The Irish Citizen Army will only co-operate in a forward movement. The moment that forward movement ceases it reserves to itself the right to step out of the alignment, and advance by itself if needs be, in an effort to plant the banner of freedom one reach further towards its goal. 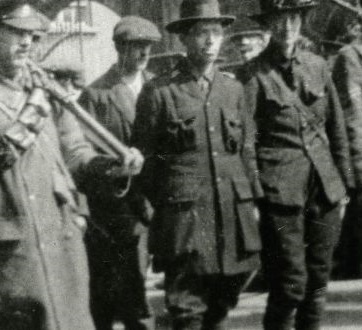 Posted on December 20, 2018, in 1913 lockout, Economy and workers' resistance, General revolutionary history, Historiography and historical texts, Irish Citizen Army, James Connolly, Partition, Republicanism post-1900, Revolutionary figures, Social conditions, The road to the Easter Rising, Trade unions, Workers rights. Bookmark the permalink. 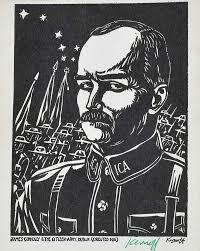 Comments Off on James Connolly on the Irish Citizen Army.